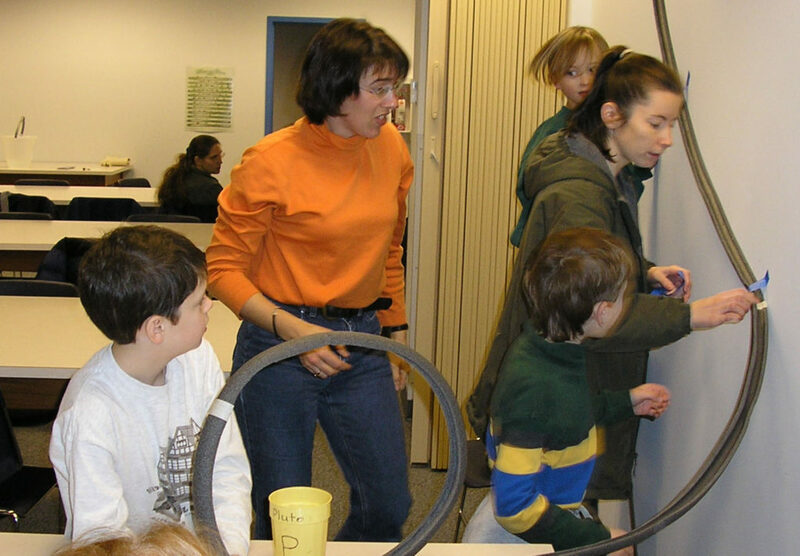 You can build a roller coaster from the foam tubes that are often used for pipe insulation. Cut the foam tubing in half and you have a track for a marble to roll down. The foaming can be taped on the wall (using masking tape) and moved around to make a roller coaster. Change the height of the first hill. How does that change the speed of the marble at the bottom? Try to make a loop. What do you have to do so the marble makes the loop? Try to launch the marble off the end into a cup. Get creative! What else can you make your roller coaster do? Roller coasters work on the principle of energy conservation. At the top of the first hill, the marble has potential energy meaning it has the potential to move if you let go of it. When you let go of the marble its potential energy is converted into kinetic energy, the energy of motion. The loop is tricky; it takes extra energy for the marble to stay on the track, so it has to slow down when it goes through the loop. When the marble finally gets to the floor, it has all kinetic energy and no potential energy. Assuming there is no friction, the total amount of energy in the system is always the same. In the real world there is friction, so some mechanical energy will be lost to heat.